I have burnt an image on a 32gb SD card and about 28gb was unallocated. I have used the disk utility on the unallocated space and made him ext4 28gb. 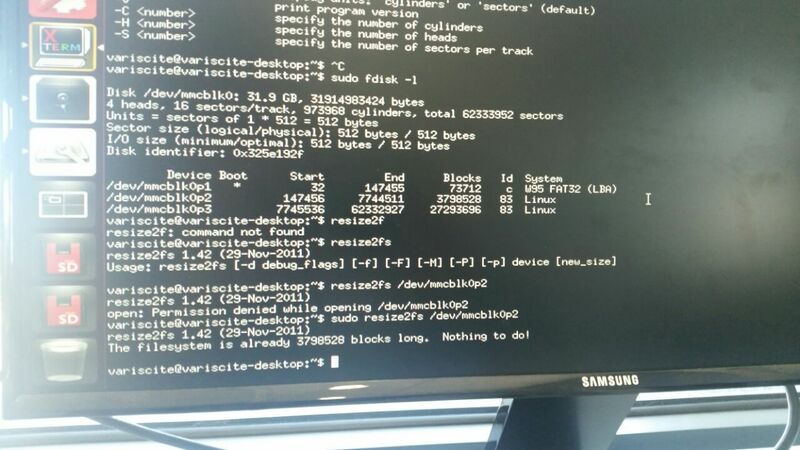 How can I resize the primary partition on runtime correctly? what exactly are you trying to do? combine the two filesystems? From the output of fdisk it seems like you have three filesystems on that device, a small FAT, a 4Gb linux and a 28Gb linux filesystem. If you previously had 28GB of unallocated space you should not have created that new 28GB partition, instead you should use a utility such as gparted to extend the 4GB partition to maximum size. Now that you have, (assuming that it is empty of course) delete that empty 28Gb partition and extend the small 4Gb partition to use the whole device. Unmount any involved filesystems before you start to be safe. gparted is graphical and user-friendly. Just make sure you select the correct device. For me it looks like the space is occupied form the partition 3 (/dev/mmcblk0p3). If I understood correctly what you want to do, you have to delete the 3rd partition and then you can extent the 2nd (/dev/mmcblk0p2). Not the answer you're looking for? Browse other questions tagged partitioning disk ext4 fdisk or ask your own question. Resizing ext4 partition and applying it to an NTFS partition in Ubuntu 12.04.1?